by DC servo motor or step-by-step motor with the advantages of speed adjustable, stabiliby good and noise lower. When the worktable of the EDM Machine moves, the light grating shows. The work liquid of the EDM Machine can be running water or pure water. (distilled water or deionized water) with better results. 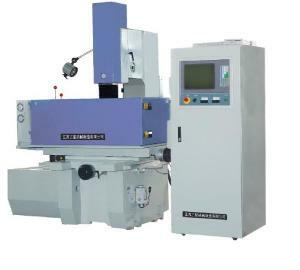 EDM machine mainly drills small holes with big depth-diameter ratio(200: 1) on stainless steel, chilled steel, strong alloy, copper and aluminum. EDM machine can also erode away the auger and taper tap broken in the work piece without damaging the original hole or threads. Jiangsu Sanxing Machinery Manufacture Co.,Ltd is a machinery manufacturer integrating research and development, production and sales. We produce CNC Wire Cut EDM Machine, EDM Wire Cuttiing machine, CNC Engraving Machine, CNC Router, ZNC EDM Machine or EDM Die Sinking, CNC Milling Machine, CNC Machining Center, Small Hole Drilling EDM and High Pressure Water jet Cutting Machine etc. Our company has been awarded ISO9001-2000 international quality certificate, CE certificated for Europe, and also honored with enterprise of hi-tech". The products have won the titles of "hi-tech products", "products meeting user's satisfaction". Moreover, we have altogether four national invention patents as well as utility patents. CNC Wire Cut EDM, we also say Wire EDM, Wire-cut EDM and CNC Engraving Machine are our key products.. The CNC Wire Cut EDM and CNC Engraving Machine are expoted to many countries. Main products: CNC Wire Cut EDM , CNC Engraving Machine, CNC Router, EDM Machine, CNC Milling Machine, CNC Machining Center, Small Hole Drilling EDM and High Pressure Water jet Cutting Machine etc.